With the availability of music streaming services for phones and the ability to take your music collection with you everywhere you go, people are turning away from traditional radio stations. 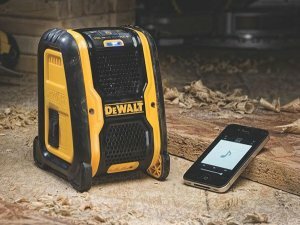 To make sure you can enjoy the tunes on your phone while on the jobsite, DeWalt has come out with the new DCR006 Jobsite Bluetooth Speaker. You won’t find an AM/FM tuner on this “radio”, this lightweight, portable, compact music station connects to a compatible phone via Bluetooth 4.0 and receives the audio wirelessly through the air waves. An AUX port provides another way to connect the speaker to your phone or MP3 player, but that means leaving your phone out in the open. The DCR006 Jobsite Bluetooth Speaker can be powered with either the included AC power adaptor or with a DeWalt 12V or 20V Max battery pack. The Bluetooth Speaker even features a USB power port so that you can charge your phone if the need arises. With two 2-1/2”speakers, DeWalt says the unit produces full, rich, sound. The new DCR006 Jobsite Bluetooth Speaker will retail for $89.00 and be available in November.